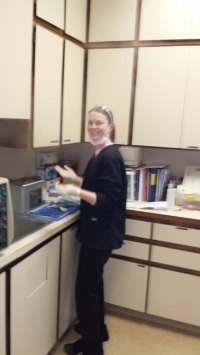 Dr. Hartman has been practicing dentistry since 1983. After 3 years as a Navy Dentist he joined the practice of Dr. Stevens and Associates. He bought the dental practice in 1991. He is known in the community for his Same Day Custom Dentures. This has been his specialty for 30+ years. When dental implants were introduced in 1989 he educated himself through his continuing education classes to become proficient in implant surgery. This technology can improve retention and function of the lower denture so you are able to chew your food better. We are proud of our 10 devoted employees who have been with us from 9 to 31 years. The loyalty of our staff is exhibited by the number of years we have had them on our team. We’ve been in the same location since 1987 serving 6 counties and the Kansas City Metro area. Dr. Hartman and his associate, Dr. Eckenberg, are both veterans who served in the U.S. Navy Dental Corp. protecting Navy servicemen from dental decay. Our office has an A+ rating from the Better Business Bureau (BBB), and has memberships in the American Dental Association (ADA),the Kansas Dental Association (KDA), and the Kansas City Dental Implant Society. It has been our pleasure to also be a member of the Bonner Springs Chamber of Commerce serving the Bonner Springs area since 1987.